Although having done work in Florence, Ambrogio Lorenzetti was known within the Sienese School of painters. 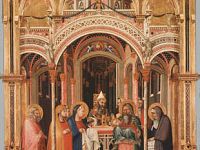 This school of painting from Siena, Italy, was an elegant style that was said to rival, at time, even the Florentine painters throughout the 13th and 15th centuries. Lorenzetti’s work survives in history with a painting from 1328 that contains the first documented existence of the hourglass. 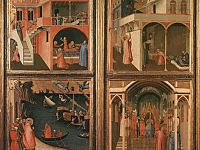 Though he also contributed a piece of historic relevance called, Well-Governed Town and Country, which is a pictorial encyclopedia that depicts an idealistic countryside, or medieval “borgo.” This piece was a familiar style of Lorenzetti’s from frescos he created on the walls of Sala dei Nove (the Hall of the Nine), or the Sala della Pace (Hall of Peace) in Siena’s Palazzo Pubblico. They are important works in Siena’s preservation of history, and exhibit the artist as an astute political and moral observer. These frescos, painted from 1337 – 1339, were secular representations of allegorical figures of virtue in how a republic was governed. Aside from, Well-Governed Town and Country, there are three more, less preserved frescos, Allegory of Good Government, Effects of Good Government, and Allegory of Bad Government and its effects on Town and Country. 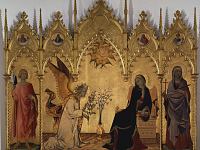 They are complex, panoramic works that contained the Gothic influence of other Sienese painters like Simone Martini (1284 – 1344). 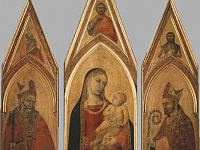 Very few of Lorenzetti’s pieces have survived and his earliest known work was the, Madonna and Child, painted in 1319. His other works, additional to the wall frescos on the Sala dei Nove, include a fresco at San Francesco titled The Investiture of St. Louis of Toulouse (1329), an altarpiece in San Procolo from 1332 titled, Madonna and Child with Saints Nicholas and Proculus, another fresco at San Francesco titled Franciscan Martyrdom at Bombay (1336), and an altarpiece of Santa Petronilla commissioned for the altar of San Crescenzo in Siena Cathedral from 1342.